Playing with toys is an essential part of the childhood. Besides being a recreational amusement and pure fun, playing also serves as an important function for the psychological, physiological and social development of a child. To further support creativity and inspire the fantasy of children, traditional toys can be enriched by adding multimedia content to them. The ideal entertainment and learning experience then comes from the combination of physical experience, virtual content, storytelling and the imagination of the user. Pervasive computing games and toys that seamlessly connect the virtual learning content with the physical toys offer many interesting possibilities for educational toys. In addition to that, they can help to facilitate the social skills development of children with social disorders or mental diseases such as autism. By adding audio components to the Playmobil Knights Empire Castle, we present an entertaining and exciting multimedia playground that fosters the children's pretend play and offers ideal possibilities of integrating interactive learning experiences into the children's play. Besides sound effects, we also play background music and verbal commentaries that adapt to the current play situation. This atmospheric music and the realistic illustrations of the figures, buildings and objects of the playset intensify the immersion into the game. To provoke further interaction, "smart toys" that implement the touch-me paradigm to identify toy objects are integrated into the playset. Smart toys are mobile devices with integrated sensors and actuators that are embedded into toys such as a magic wand or a magic bottle. Children can use the smart toys to touch pieces of the playset either as part of a learning scenario, a story that unfolds, or simply as part of free play. Designing a truly pervasive computing game and learning experience, we required that the augmentation does not interfere with, block or compromise the traditional play in any way (i.e., toys are handled in the way children are used to). Furthermore, we did not want the children to wear any special equipment such as head-mounted displays since this would also interfere with their free play. RFID technology represents a suitable means to bridge the physical and virtual world in an unobtrusive manner and is our choice to detect the position of objects in the playset (in our case 13.56 MHz RFID technology). The stationary readers with antennas cover several important areas of the playset. The RFID tags of different sizes are attached to or incorporated into the pieces of the playset to uniquely identify them. Since a reliable detection of tags is dependent on the orientation of the tags to the antenna field, we incorporated up to three tags in different orientations to play figures (e.g. tags in the head, at the back and at the foot of a figure). This approach also allows us to detect if a figure is standing or lying on the ground. An augmented toy and social interaction in children with autism. The Augmented Knights Castle and Social Interaction in Children with Autism. Kingdom of the Knights: Evaluation of a Seamlessly Augmented Toy Environment for Playful Learning. Interactive Educational Play with Augmented Toy Environments. Managing Augmented Toy Environments - A New Perspective for Smart Space Management. Integrating Interactive Learning Experiences into Augmented Toy Environments. Semantic Mapping of Augmented Toys between the Physical and Virtual World. 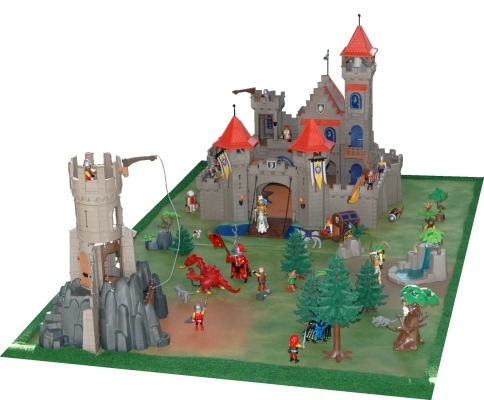 The Augmented Knight's Castle – Integrating Pervasive and Mobile Computing Technologies into Traditional Toy Environments. Von traditionellem Spielzeug zu smarten Spielumgebungen - Die Integration mobiler Geräte in Pervasive-Computing-Spielen. Mobile Device based Interaction Patterns in Augmented Toy Environments.